I haven't been updating. Lack of inspiration so felt lazy to write some dry posts. Today is a very special day for a being who has been in my life for two decades. 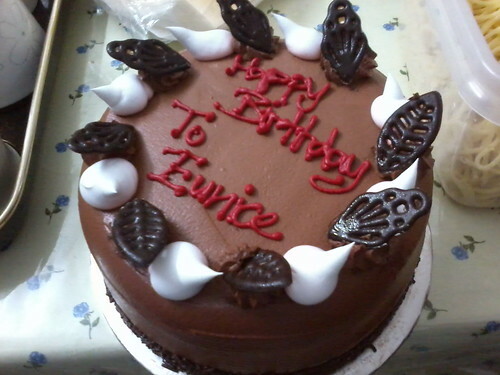 Happy Birthday, Eunice! You are no longer a teenager now so you have to act more like a lady. No more 'hanky-panky' (quoted from Chee Foo) from now on. Two days ago, we celebrated her birthday at Pastor Jenny's home. Look at the wonderful food she prepared for us. Thank you, Pastor! Good lighting for pictures! 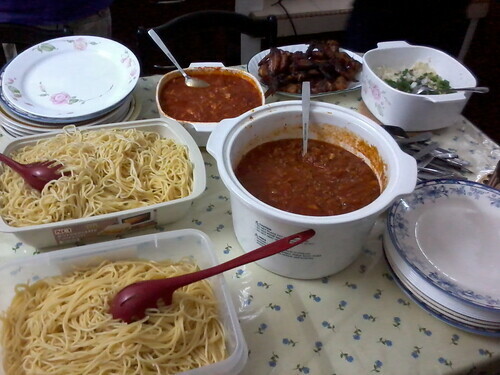 Spaghetti, mashed potatoes and chicken wings! Till the next time. Gotta start doing group assignment already. Since I am doing the conclusion, I still have some time to stall. Comrades, do slowly so that I can rest longer. Waahahahaha!!! IBIG Band was in town! Marvelous lunch and new guppies!